I thoroughly enjoyed planning for our wedding. The oc-ness reached its highest levels to ensure a very memorable beginning for a new life together. I’m extremely thankful to my in laws for providing us with a grand celebration! My over-all glow! I’m in love with how I looked that day! I’m sorry I’m vain like that but hey, it was MY day! The gown was by Mia Urquico. It was heavy and kind of hard to walk in with all the frou-frou but it was divine! I was also wearing blue shoes customized by Mia as well. I would definitely recommend air brush make up for lenghty events like weddings as it feels really light and does not need retouch at all! Mine was done by Monica Reyes and her partner AC Ramos styled my hair. 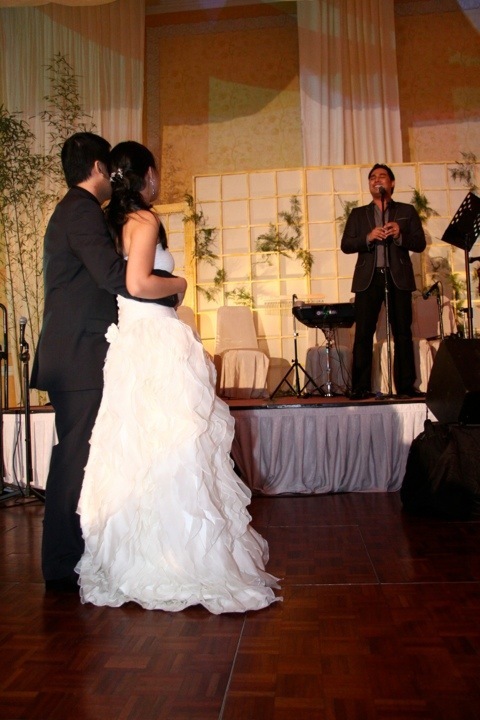 Dancing to “Forever’s Not Enough” by Jed Madela! 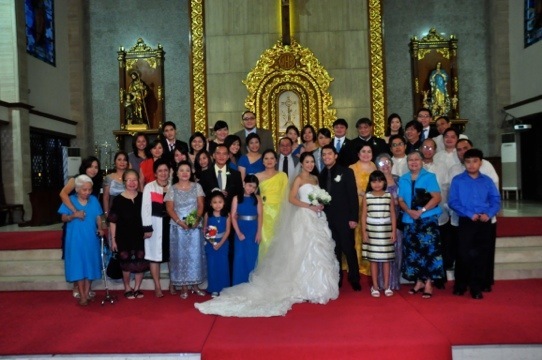 Weddings are grand family reunions. This was when the tears really started to flow. I was really happy to see my relatives together, sharing in my most happy moment. be professional. It was my mistake to be friendly with the suppliers. I was lenient and very understanding. You’ll have time to be friends with them after the wedding so be firm with deadlines, tell them exactly what you like and don’t like and call them out when they’re not working up to par. it is your wedding, so go with what pleases you. I’m sure your parents, in laws and guests would affirm everything that makes you happy! the entourage need not be relatives.they should be the people who mean a lot to your relationship. And make sure that they know their roles, if they have something to say, something to keep and hand over to you, or who their partners would be! My secondary sponsor walked with a ninong! How tragic! PREPARE A DECENT WEDDING SPEECH!! !I’m still whacking myself on the head for not having one. Ok, I had one but didn’t dare to read it! So, I mumbled my thank yous and even said sorry for being a crybaby! Next PostNext Roll over, Z!